Proper bonding will make you your bird's best friend. The key to forming a strong bond with a cockatiel is trust. If your birdie trusts you, he will be comfortable in your presence and accept you as his caregiver. Bonding with your 'tiel begins with his first day in your home and continues as you interact with your pet. The first day your cockatiel enters your home is your first opportunity to bond with your new pet. The homecoming can be a stressful time for your bird, because he is entering a new environment where everything is unfamiliar. When you first bring your cockatiel home, give him some time to familiarize himself with his cage before initiating any interaction. When you approach your cockatiel's cage, do so slowly, and speak in a soft voice. The goal is to keep the bird as calm as possible while he adjusts to your presence. 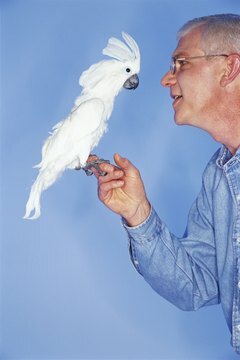 Increase your interaction with your cockatiel gradually as the bird becomes more comfortable with your proximity. Your bird will form a strong bond with you if you handle him properly. Cockatiels can be taught the "step up" command -- when you say "step up," the bird will climb onto your hand and is ready to be taken in or out of his cage. Do not just reach into your pet's cage and take hold of him. Your cockatiel sees his cage as his personal space and when you reach in to take him forcefully, you become a "home invader" in the bird's mind. Gentle handling done with the bird's permission is the best way to share affection. Your cockatiel depends on you for food, water and shelter. If you feed your bird at the same time every day, your bird will learn to trust you to provide for his needs regularly. Hand-feeding your cockatiel will deepen his trust for you and will strengthen your mutual bond. However, it is important to teach baby cockatiels to eat from a food dish so they don't become dependent on hand-feeding. Hand-feed occasionally as a bonding experience; it should not be the bird's primary means of obtaining food. Playing with your cockatiel is one of the easiest and most enjoyable ways to bond with your bird. Interactive play can include throw and catch games with small toys, retrieving games played outside the cage, or teaching your cockatiel tricks. If you play together, your bird will associate positivity with your presence, and will learn that when you enter the room, good things will follow. It can be challenging to bond with a cockatiel who is already bonded to another bird, but it is possible. It is important for you to bond with both birds so they feel comfortable around you, trust you to care for them, and so you can play with them and have positive interactions. If your cockatiels are bonded to each other and seem to be ignoring you, house them in separate cages in the same room until they are retrained. Keeping them in the same room will prevent them from going into withdrawal from each other, but will also make them more open to bonding with you. Once you feel you have permanently strengthened your bond with each bird, you can reintroduce them into the same habitat. National Cockatiel Society: Pairs: Bonded, Proven, or What? What Can You Use for Treats for Cockatiels? "If One Cockatiel Dies, Will the Other Be Lonely?"